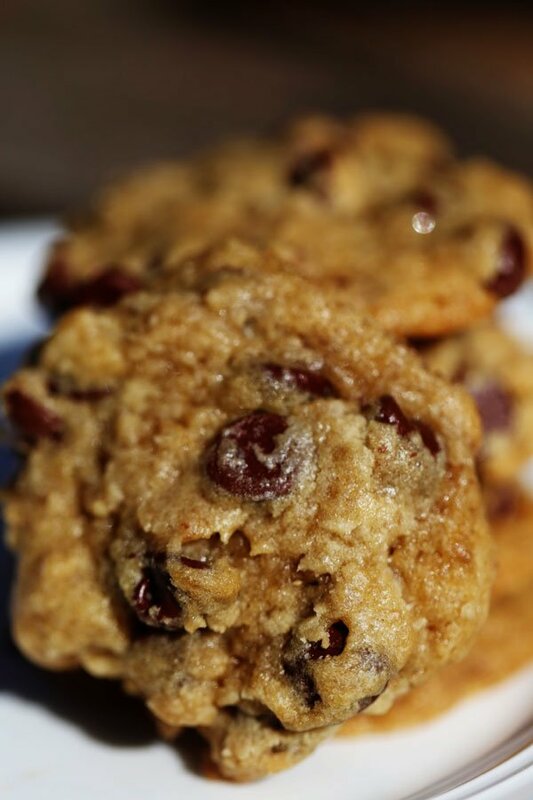 Mrs Fields Cookie Recipe stuffed with chocolate chips is just like you remember from the mall. SO buttery and melt in your mouth delicious!! 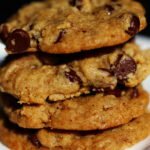 I had always wondered why the Mrs Fields cookie recipe tasted so different than other chocolate chip cookie recipes. And, I decided to find out today. Growing up, I used to love to visit the Mrs Fields cookie store in the shopping mall. I always thought it was so cool the way they scooped out the mounds of dough with their big ice cream scoopers. I remember their large cookie cakes for birthdays and other celebrations decorated with bright colors and swirls of frosting looked so festive. Salted butter, rather than unsalted. Chilled butter, rather than softened. My family really gobbled these cookies up. They taste so buttery and chocolatey with the perfect crisp top. This is a definite keeper. Chill the dough for an hour after mixing to prevent the cookies from spreading while cooking in the oven. Do not skip the step where you cut the chilled salted butter into cubes. I found this step really helped the butter to fully incorporate into the batter. Do not overmix and mix on low speed. Just mix the ingredients in your stand mixer, until you do not see streaks of flour. I’m now looking forward to trying out the Mrs. Fields sugar cookie recipe and Mrs Fields peanut butter cookies recipe soon. The Mrs Fields chocolate chip cookie nutrition facts are below the recipe. 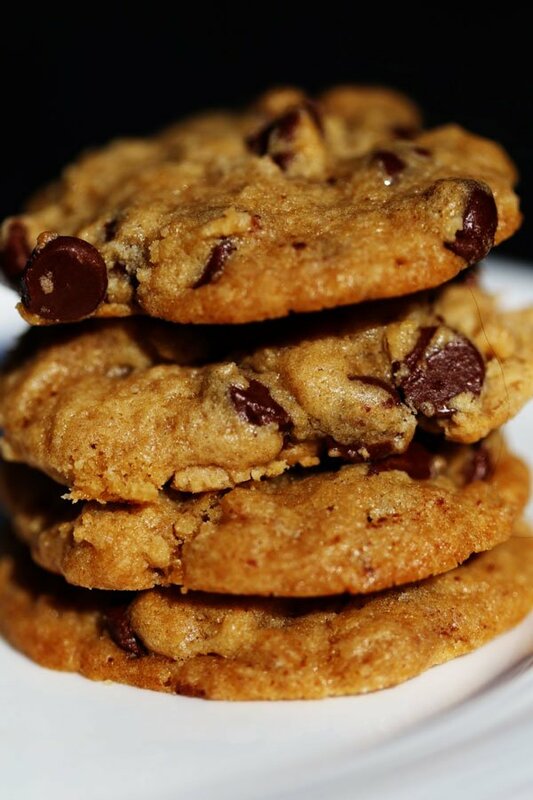 The good news is, you’ll see its pretty similar to traditional chocolate chip cookies. I always thought Mrs Fields cookies tasted more buttery than others (and therefore not as good for you), but I think that comes from the chilled butter instead of softened and longer cooking time on a lower temp. Really helps maintain the wonderful buttery taste. So, so good. In medium bowl, whisk together flour, baking soda and salt. Mix well. In a stand mixer, mix the sugars well on medium speed. Add the cubed cold butter to your mixer and mix until a grainy paste forms. Scrape down the sides of the bowl. Add the eggs and vanilla extract. Mix at low to medium speed just until combined. Be sure to not overmix. Add the flour mixture and chocolate chips. Blend at low to medium speed just until combined. Again, make sure to not overmix. Chill the dough in your fridge for an hour. This will help to prevent the dough from spreading while cooking. Scoop tablespoon size dough balls and place on parchment paper lined baking sheet. Bake at 300 degrees for 20-22 minutes until cookies are a golden brown. Immediately transfer the cookies to a cool surface. I use parchment paper always. It makes picking up the parchment paper and transferring a sheet of cookies much easier than taking one by one off the hot surface. Enjoy! You're going to love these.